There is so much to love about this sweatshirt that I'm not sure where to start! This is the Hey June Raglan Pattern. 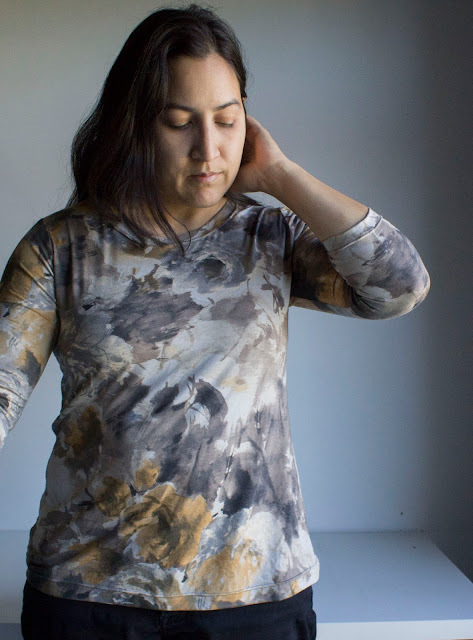 I've avoided raglans after my one make with a big-4 pattern was a barely salvageable hot mess. But seeing other really nice Lane Raglans out on blogs, I decided to give it a try. I actually bought this pattern at the end of last year during a Hey June pattern sale, but it is on sale again right now if you want it! It could not have been simpler. 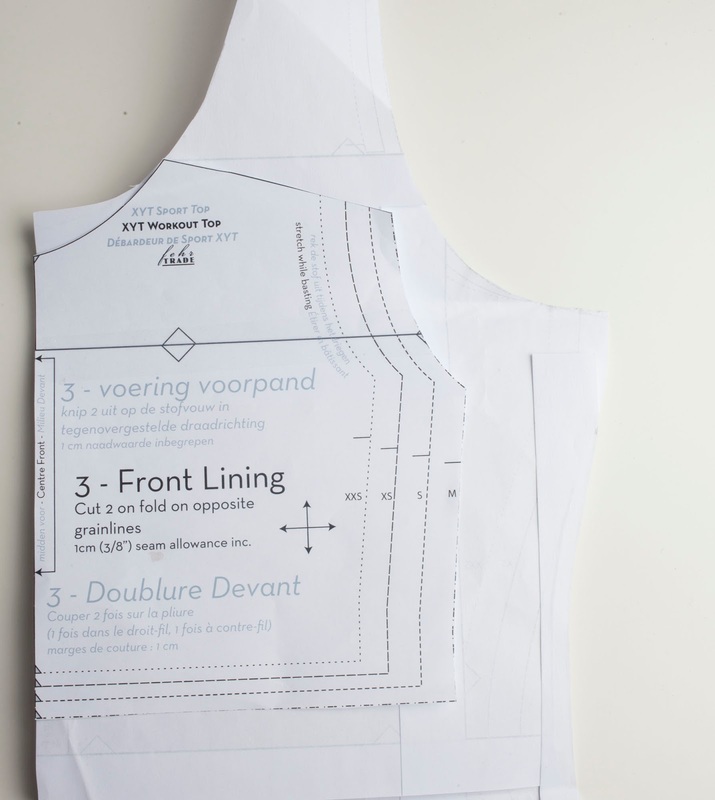 I love that the finished garment measurements are right there next to the size chart-- sure, I could always go figure them out by measuring the pattern, but it is so nice and easy to have them all laid out for me. My measurements put me in a large, but I decided to go for an XL to make a nice slouchy sweatshirt. If I were making a T-shirt with one of my favorite stretch knits, I would probably go for the Medium for some negative ease. Having that sort of control over fit is what makes sewing so worth it! I made no other changes to the basic pattern. I was going for a slouchy fit, so there was no need to fuss! I'm on a fabric buying fast, so this fabric actually is from the thrift store! I found two french terry sweatshirts in two different but coordinating stripes... they cost me about 3 dollars. 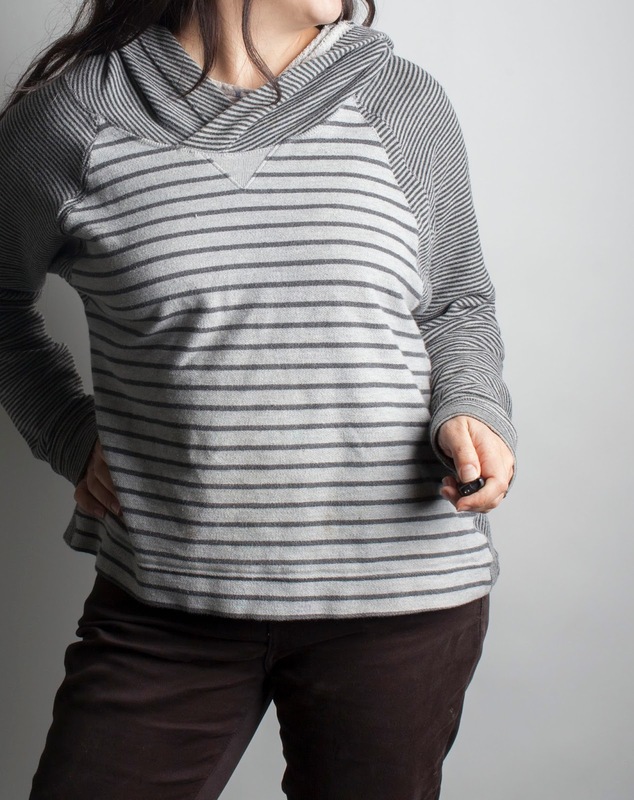 The wider stripe is 100% cotton, and the small stripe is a rayon/cotton blend. As usual, refashioning encourages some creative design choices. The extra little triangles at the raglan seam and at the hips are not part of the original pattern, but I tried my best to make them look intentional, even if they designate places where I needed just a bit more fabric than I had! Pattern matching the stripes just wasn't in the game plan for this sweatshirt, too much else going on with the tetris-like layout process. 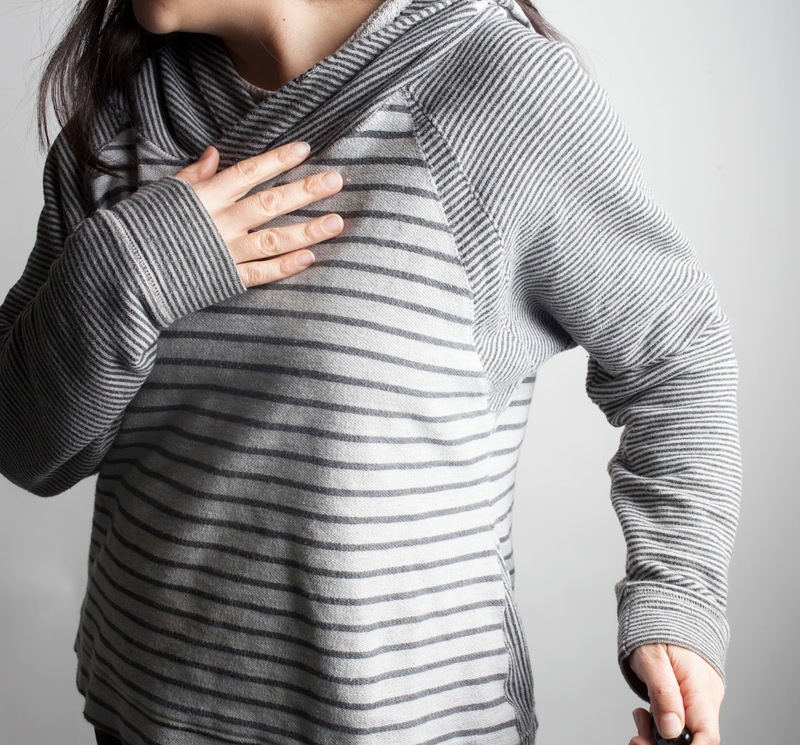 The neck triangle and the wrist cuffs are reused from the original sweatshirts. There's a funny seam mid-arm that I tried to camoflauge in the stripes-- yet another artifact of the refashion process. The hood on this pattern is pretty huge, worthy of Obi Wan Kenobi. That's sort of fine with me in a casual sweatshirt... I just like to throw it over my head every now and then for kicks, or to play peek-a-boo with the baby. I didn't bother with a drawstring. I love the lapped front of the hood though, nice and cozy. 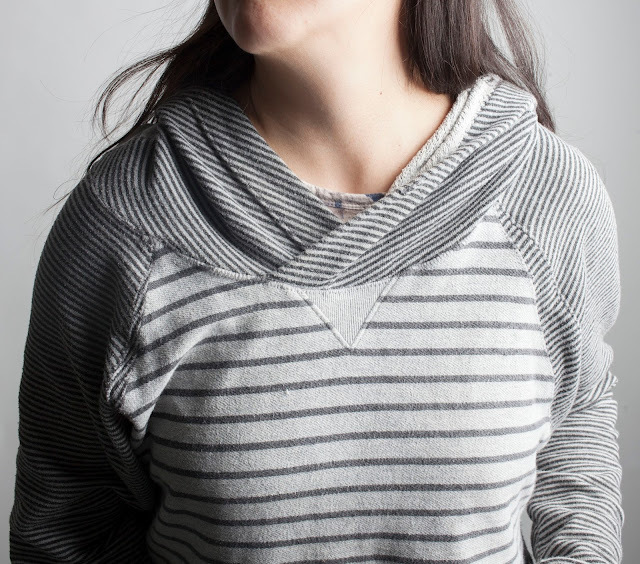 The one thing I don't love so much is that the weight of the hood pulls the whole sweatshirt back, so I am often feeling like I need to tug things forward. But it's not too much of a problem, since I wear this sweatshirt all the time! There's something very satisfying about re-using textiles. Have you made anything from thrifted fabrics lately? Hello dear readers! I humbly admit, I have been keeping some secrets from you... I have been working on some patterns. If you have been following my Instagram, then you will have seen some sneak peeks. Aren't they gorgeous? So, if you would be interested in pattern testing this pattern, please sign up for my pattern testing list so that I can send you the details! I plan to have a clothing pattern ready later this year, so if you are only interested in clothing patterns just indicate this on the form. I haven't made t-shirts in ages, so these three have been in very heavy rotation since I made them. The first up is actually a remake. You can see the original here, at the very bottom of the post. 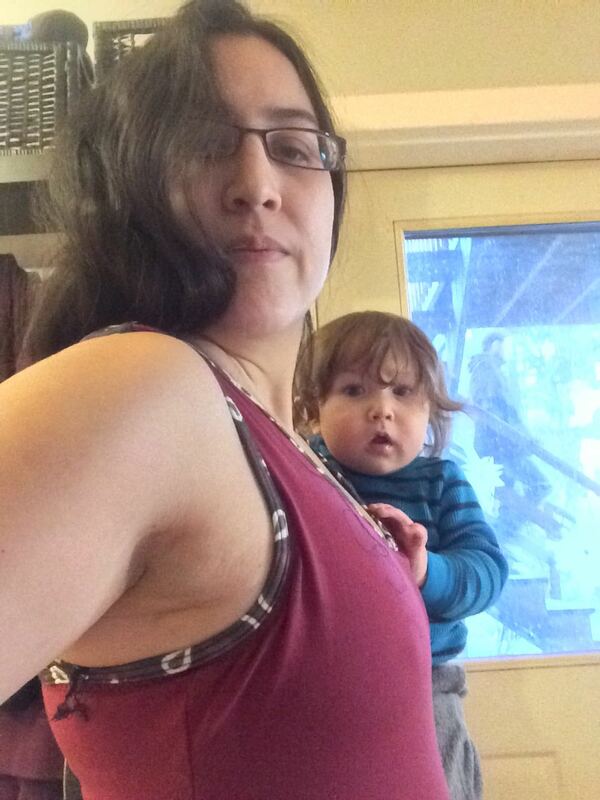 It was originally made up as a maternity top, using a vogue pattern. 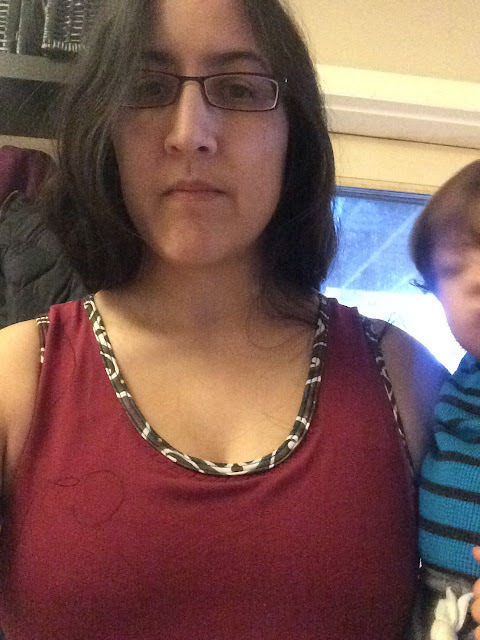 But the fit was pretty sucky, even for a maternity top. The neckline was huge and saggy, it was massively wide, and too short. Yuck. Even if I were to get pregnant again, I think I would rather just make a new maternity tee! But this print was too fun to waste, so I cut it up and remade it using my TNT princess seamed top. 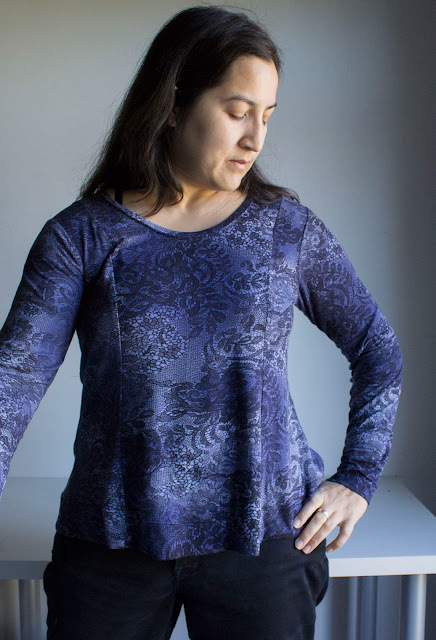 And here is another from the same TNT pattern, made up in an indigo lace rayon jersey from Marcy Tilton. This one I made "swingy" by flaring the pattern at the hips. And finally, a new pattern... the Hey June Union St Tee. LOOOVE this pattern, there will be many more of these in the future. 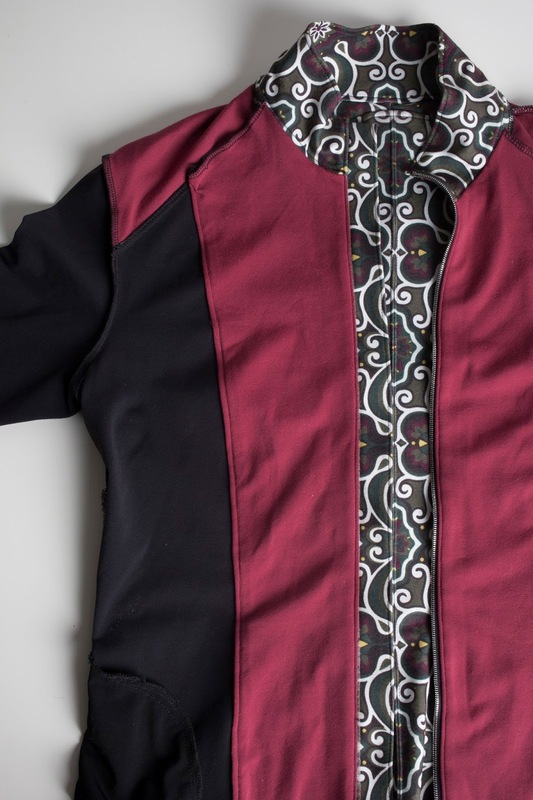 It is very quick (only a front, back, and sleeves) and the fit is great right out of the package. Even the length is perfect for me. Hey June is my new pattern company crush. I want all of their patterns! The fit is just spot on for me. I sized down one size because I wanted a close fit. For the neckline I used the provided pattern piece to make the neck band, and I finished the sleeves and hem with a twin needle. 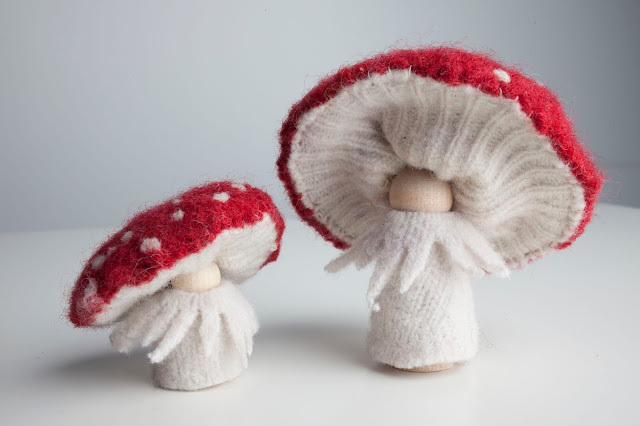 When I get clear of the project I'm currently embroiled in, I want to make a dozen of these! While walking in the woods the other day, I encountered an amazing sight. At first, I did not comprehend the depth of my own discovery. I had stopped to admire a lovely grouping of what I thought were Amanita Muscaria, the famed Toadstool or Fly Agaric, which are rather uncommon but not unheard of in my region. 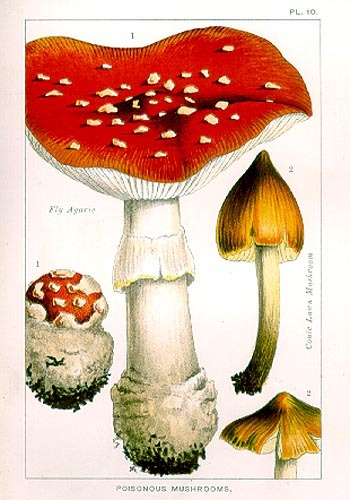 When I stooped to look more closely, I was quite surprised to see that these were not just any Amanitas, but the fantastical variety that are more commonly heard of in German folktales. I had never expected to meet any in the forests of the Finger Lakes! This lovely pair, a mother and her baby toadstool, conversed with me about seeking a young person who might entertain them by incorporating them into their stories. You see, Mushroom People thrive on the burgeoning imaginations of young people. Having recently joined the Etsy community, I told them that I would place their plea out to the good people who peruse this community. 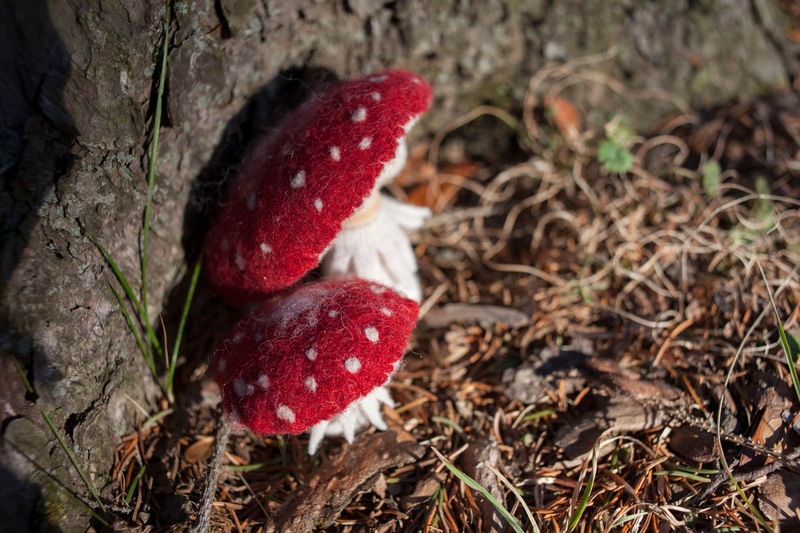 So, if you know a young person with a good imagination, perhaps involved in a Waldorf program or otherwise taken with fantastical interpretations of the natural world, then please consider adopting this mushroom pair. 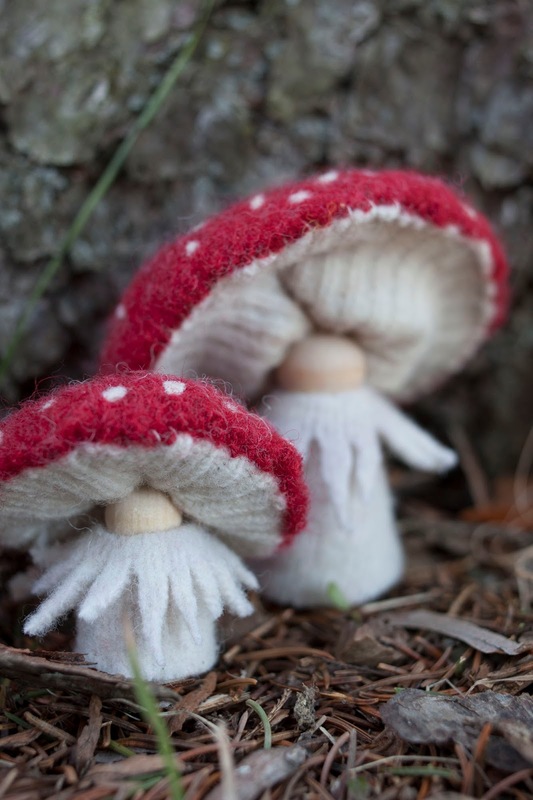 Mushroom people also enjoy being admired by adults, if you know of any mycophiles who might appreciate a fantastical interpretation of their hobby or science. (You might like to know that these toadstools are made out of 100% wool felt from recycled sweaters. They are hand stitched and felted details are added with wool roving, and when stuffing is required, only 100% clean washed wool is used. 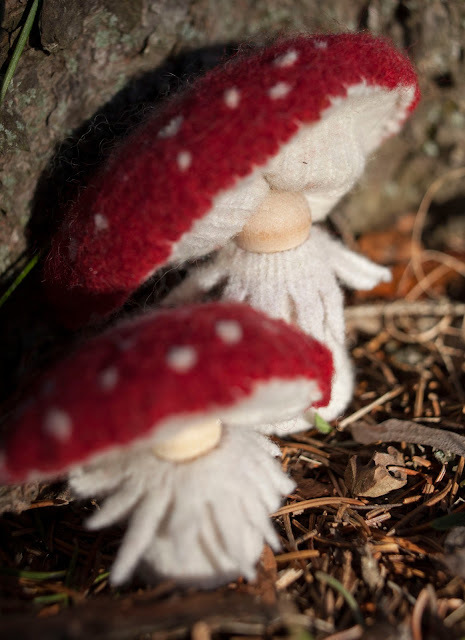 Their bases are made out of wood, and thread and glue are used to hold their wool coverings in place. They are appropriate for play by children who do not eat their toys and have learned to care for handmade toys). I hope you find some wonder in your day today! Fehr Trade XYT Top... Success! This top was put me in seamripper purgatory for a very long time. Hours of it. But I persisted, and here it is! This is the XYT top by Fehr Trade. It is not a difficult top to make, really... many people out there have successfully made them. And I thought it would be a quick make when I basted together the pieces, without the internal bra inserted, and it seemed to fit great. The problem I had was when I inserted the internal bra. Unfortunately, I didn't realize how bad it was until I had all of the binding put on. The internal bra is stretched to fit, and basted in place. It looked a little funny, but I thought that perhaps when I had put all of the binding and elastic on then it would all work itself out. It didn't. It was horribly, uggily baggy around the armholes and the neck. Here are some not so great pics. I think it looked worse in person. It was so bad that I would have never work something like that in public. My first theory was that the compression bra was actually making me a size or two smaller. 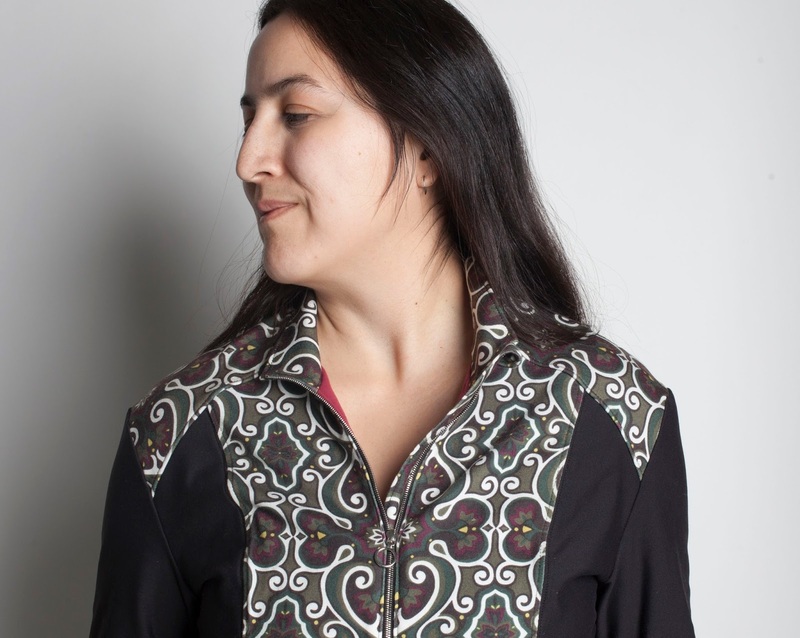 I had originally cut a size small, so I cut the neck and armholes down two sizes to the smallest size, an xxs. Then I reattached the bindings. Still saggy-baggy! Off came the bindings again. FYI, I was attaching the bindings by serging my binding strip to the wrong side with a 4 thread stitch, then turning it under and topstitching with a twin needle on the front side. So unpicking all of this was arduous. Taking note of the direction of the fabric pulling, it seemed clear I needed to take in the side seams. I took them in an inch, and this helped but did not entirely remove the bagginess. At this point adjustments were faster because I had gotten smart and was just basting the bindings on. What finally worked was adjusting the neck, armholes, and side seams to be the same size as the internal bra pattern pieces. This is a very drastic reduction! It is about 1.5 inches in the side seams, over an inch in the underarm, and about .5 inches in the neckline. In the pics below, you can see the pattern piece for the top (cut to a size Small) with the compression bra piece laid over it (size Medium). I decided to size up for the compression bra, since pattern reviewers almost universally felt that it was rather tight (I have a 39 inch bust right now). I then curved the side seam back out to a size Medium, since I was thinking I needed the width in the hips. Finally, nice smooth neckline and armholes. Of course, while I was struggling with this problem, I read many, many reviews of this top. It seems that this bagging around the armholes and neckline are very common for people who try to make the compression bra version. People get around it in various ways... many just skip the compression bra. Some people seem not to be bothered by the bagginess... it makes a very functional top even if the top layer isn't perfectly smooth. 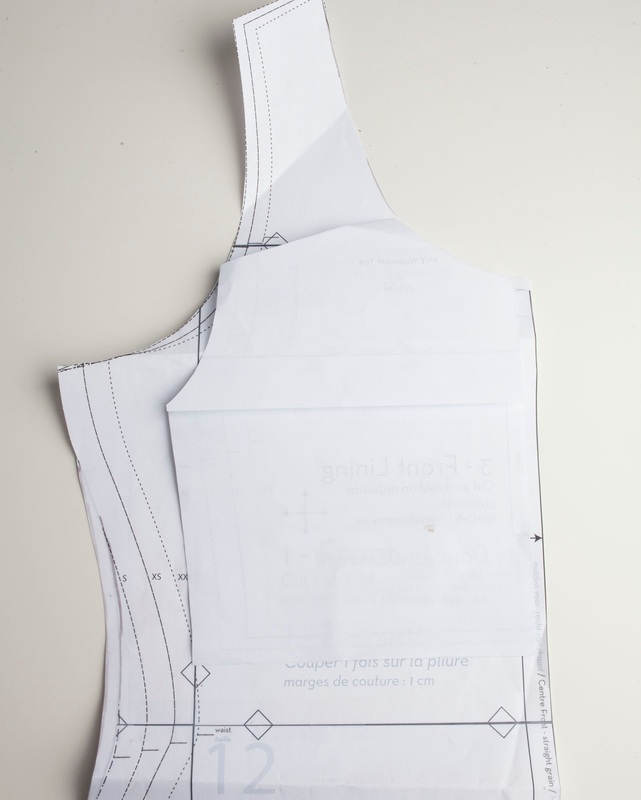 Other fixes I've seen out there involve doing a FBA and adding darts to the neckline and armholes. 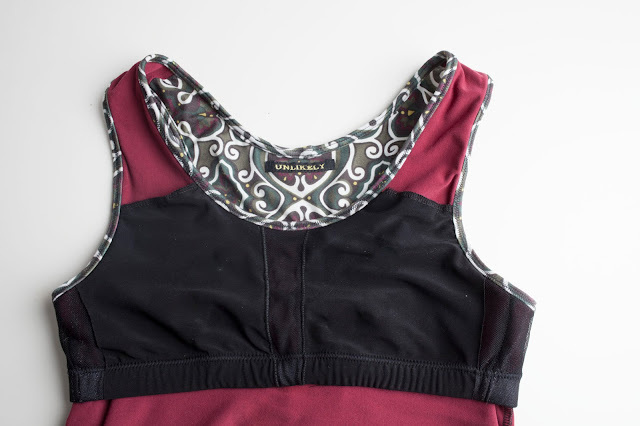 I don't know if my solution will work for other people out there, but cutting the outer layer to be the same shape as the inner bra definitely worked for me, and would probably work for other versions as long as you were using a 4-way stretch performance fabric. I also added 3 inches in length to the top, and flattened out the waist curve quite a bit (I don't have much of a waist). I probably went a bit overboard on the length... probably 2 inches would have been sufficient, but I don't mind the extra really. I probably could also have gone down to a small in the hips, it is a bit flared... which doesn't bother me, but I probably would change next time. I do wonder though if there is a more elegant way to attach the bottom of the X to the top. Admittedly, I could have done it more neatly, but I was ready to be done with this top! Oh, and another modification, inspired by my RTW tops... I added some very light weight supplex over the mesh so that the mesh would not be right up against the most sensitive part of my chest. The supplex panel is not attached on the side, so you can also slip in an extra foam cup for more coverage. 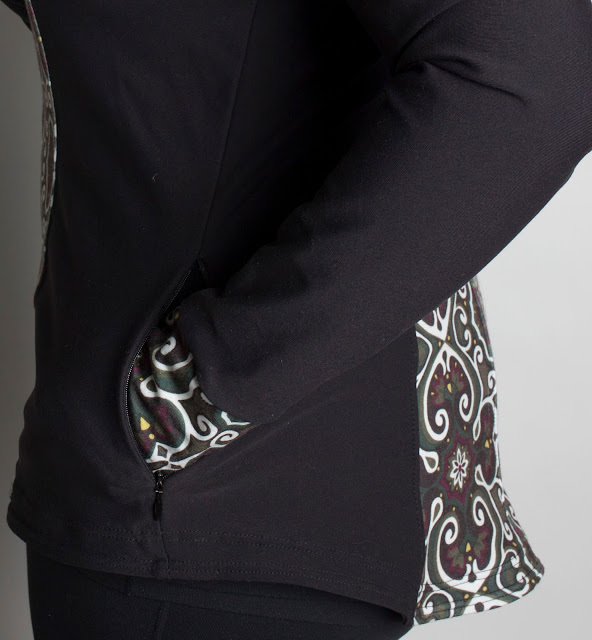 This top matches my last two makes, the Greenstyle Sundance Jacket and the Hey June Sloan leggings. 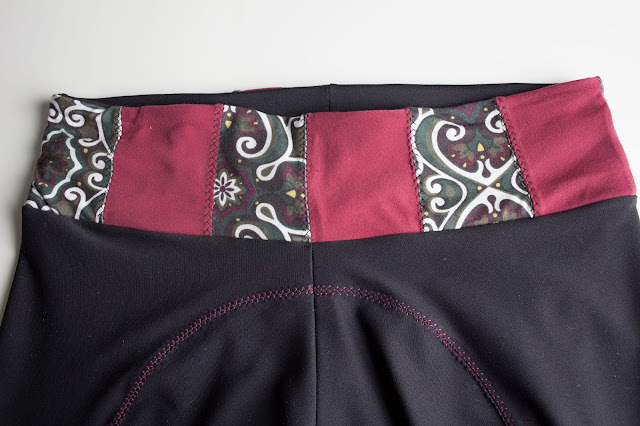 I used the same fabrics... in this case, I used a burgandy mid weight supplex and a scrollwork mid weight supplex, both from Peak Performance Fabrics in Calgary, from their LLL fabric collection. The powermesh I used (two layers!) came from Emmaonesock. The light weight black supplex that I used for lining the cups also is an LLL supplex form Peak Performance Fabrics. After all of that, I'm pretty happy with the top! I have yet to go for a run, but it feels more supportive than my other RTW tops with internal bras. 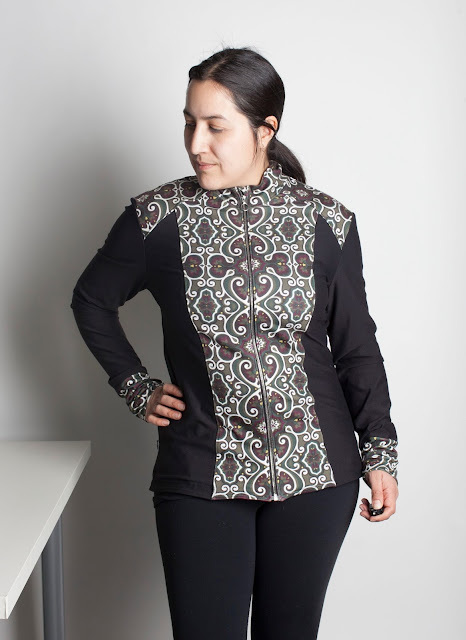 Thanks to Pattern Review for hosting an activewear contest... I hate seam ripping, so I honestly think this would have been headed for the UFO bin if I didn't have a deadline! Will I make this again? Probably, after I get over the saga of fitting. Hopefully the next one will come together more quickly now that I have worked out my issues with the bagginess. Fantastic, fun leggings... finally! Hey June Sloan Leggings with vertical striped waistband. I have to admit that I have not posted my leggings failures. They are just soooo depressing. Leggings should be a simple thing to make, and I just haven't had any real success until now. First, I tried self-drafting a pattern. Until now, these were my best pair. I think there are several tutorials out there, the one I used was very similar to this one. I made them up in a nice high quality supplex (from Peak Performance Fabrics, their LLL pantweight). They are okay. One problem that would be easy to fix... the ankles and calves turned out too tight. The other problem I was unsure how to fix... I made a yoga-style waistband that was stretched to fit the top of the leggings, but they still tend to get saggy over the course of a day. In general, the fit just isn't quite right... that tight calf is surprisingly uncomfortable, and I think it tends to pull the whole legging down. Then I tried the Papercut Oooh La La leggings. I think the pattern runs large, and I like my leggings tight. And... I didn't do a muslin or even baste, I just dived right in, topstitching and all. I'm not sure what I was thinking. When I got to a point that I could try them on, it was clear that they are multiple sizes too large. Yuck. And the waistband is an issue... weird height, uncomfortable elastic, will require trial and error to find a good solution. So those are sitting in my UFO pile, waiting for me to have the patience to take them apart and redo them 2-3 sizes smaller, or just toss them. At least they are just capri length, if the whole thing is just a waste. I also purchased the Fehr Trade Steeplechase leggings pattern. I like the idea of leggings without an inseam, but I'm fearful that these will be difficult to fit. So I haven't even printed them off yet! Recently I've been having a bit of a love affair with Hey June patterns. I have a few recent unblogged makes... simple things, Ts and sweatshirts, but Adrianna's patterns have so far been almost effortless for me to fit and wear. I hate to spend yet more $$ on the quest for great leggings... but I just had a feeling that Hey June's Sloan leggings just might be a good fit for my body. The top is RTW, a 4 year old LLL cami-style workout top. Will probably clone this one day! The leggings are of course the Hey June Sloan Leggings. These were just as effortless as her other patterns-- at least for my body! I have learned a few things from my failures that probably helped make this a success for me. 1) With leggings, you want a tight fit. Saggy-baggy leggings are just no fun. So, size down, a little or a lot. 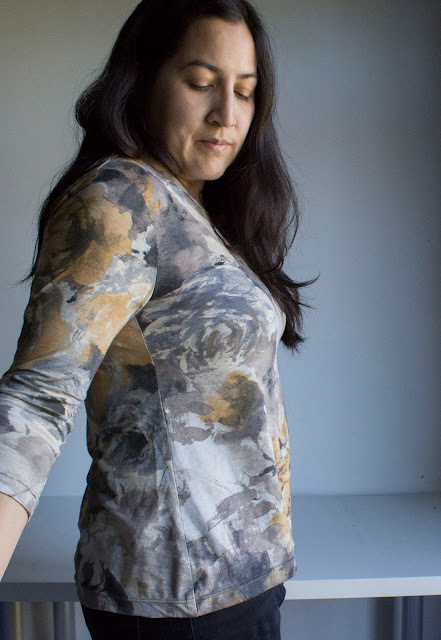 Since Hey June patterns seem to be drafted pretty true to size, at least for my body, I sized down just a little. By my hip measurement, I fit solidly into the Large, so I made the Medium. Because I was just a tiny bit worried I had gone too far, I used a 1/4 inch seam allowance instead of 3/8. 2) Muslins for stretch fabrics are pretty darn useless, in my experience. 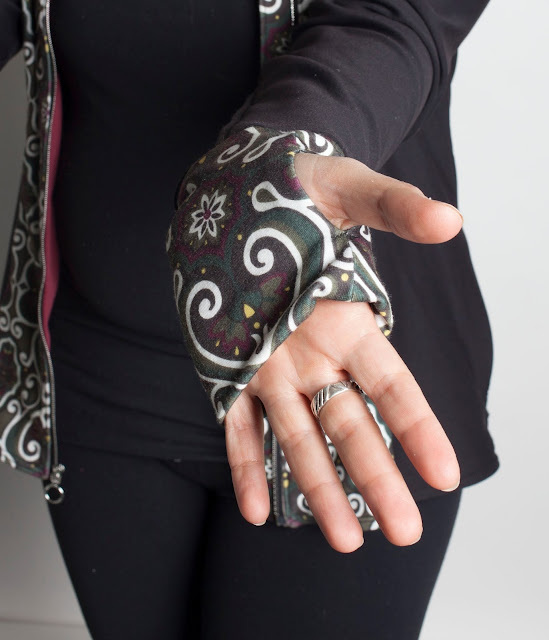 They might help if you expect large fit problems, but for minute differences, like the ones that make the difference between so-so and really great leggings, a muslin doesn't help because the way an individual fabric performs is so important. Therefore, I baste-fit my workout wear. So far, this has worked much better for me, since I can feel the way a fabric will work with the pattern and the sizing. It is sort of time consuming, but much better than unpicking non-basting stitches. 3) Sergers are awesome for workout wear and knits. Yes, you can use the Zig Zag. Been there, done that, it works-- I've been serger-less for over 4 years, and work with knits regularly, so I have many zig-zagged garments. However I always felt those zig-zagged seams never looked quite right, and I can and do break zigzagged seams on a regular basis. In my previous legging attempts, double stitching or top-stitching has been a must for me, just for security. But it is soooo much faster and more satisfying to serge. 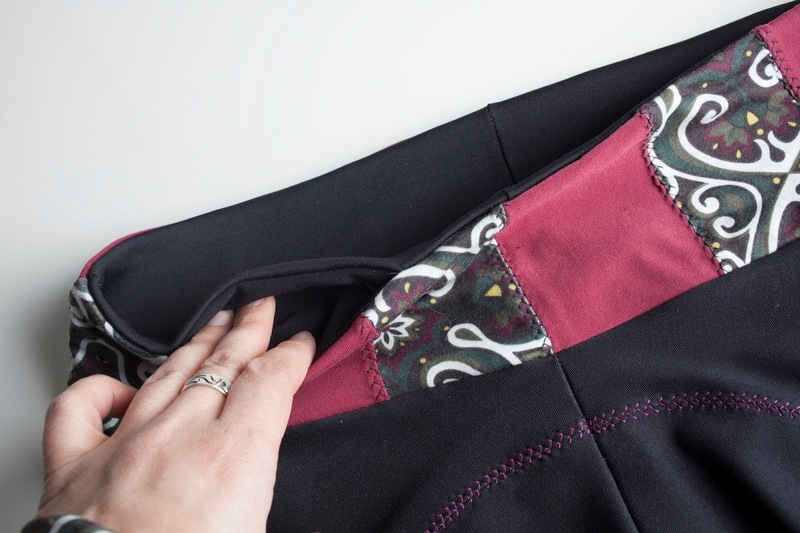 The 4 stitch overlock is secure and and stretchy, and the interiors of finished garments are much cleaner-looking. Back to these leggings! I used a black wicking supplex from Peak Performance... I'm out of LLL fabric, so this was their Yoga Jersey. It is a little more slick and less cottony than the LLL, but has a nice weight and great recovery. I basted to fit, and they fit great on the first try. Basketweave stitch as a fake flatlock... in red on the curved seams, and in black on the waistband. 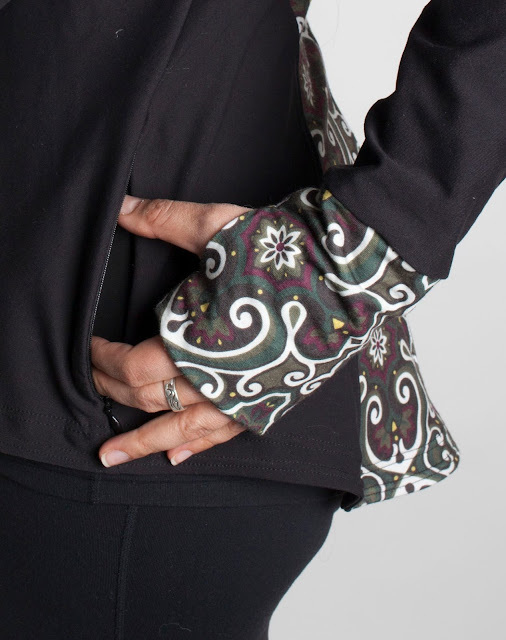 I'm a black leggings kind of woman, but I wanted to highlight the cool seaming, so on the curved seams I first serged the seams, then used a decorative topstitch (I was inspired by the Sewaholic tutorial for their Pacific leggings on fake flatlocking). Waistband piece together, waiting to be joined with the lining. I also designed a cool vertical stripe waistband. This was the most time consuming part of the process. I traced the waistband pattern pieces, cut them up, and added seam allowances. Then I serged them together and topstitched with the basketweave stitch, all the while praying that I had done it properly and they would still match the waistband lining pieces. They did! 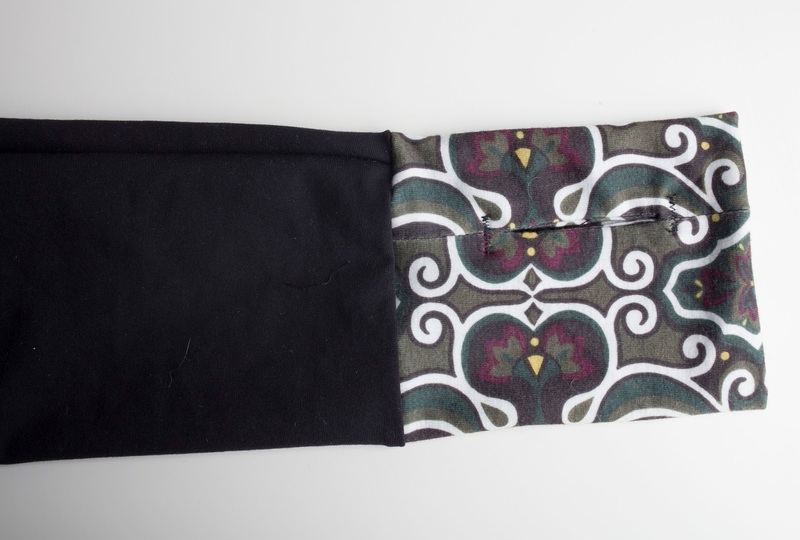 For the waistband, I did all of the suggested things in the pattern to help it keep its shape. I interfaced the lining pieces with a lightweight knit interfacing, and inserted clear elastic. And I made the super cute little pocket... very easy (the instructions were excellent) and very clever. It looks super professional, just like the pockets in high-end leggings. Perfect size for a phone to play your tunes! And the pocket opening is just a tad smaller than the pocket, so your phone will stay in there and not wiggle out. The fit of these leggings is pretty spot on. I was worried that the waistband would not be high enough for me... but actually, it is perfect. It comes to just under my belly button, and the back rise is high enough to cover the booty and still have the waistband be level. Another thing I love, which is just the problem I was having in my self-drafted leggings, is that the Sloan is drafted to follow the shape of your calf. Obviously, these are hot off the presses, so I don't know yet how they will perform in the long-term, but I will keep you posted. So far they feel great, so I'm eager to try them out in the real world. Oh, and I'm sure you figured out, I made these to match my Greenstyle Sundance Jacket. Pretty sweet, don't you think? They are a bit matchy-matchy, but in reality, I'm unlikely to go around with my top tucked in, so the cool waistband is mostly for my own amusement. Anyhow, I'm eager to get to road testing the leggings, because if they work as well as I hope, I want to make more! It has been years since I've had a nice new pair of leggings. I want some capris and shorts too! 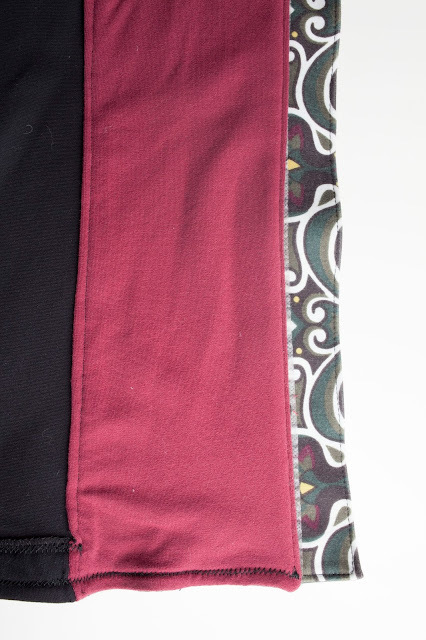 Although I'm not sure I have the budget for any more fabric and I'm all out of black wicking supplex, so I think I might try to fix the Papercut leggings by cutting them apart and sewing them several sizes smaller and using the waistband pattern from the Hey June Sloan Leggings. I can't wait to show you all this make. I was trying to contain myself-- but I just can't. This is the Sundance Jacket from Greenstyle Designs. I can't remember how I found it, but as soon as I saw it I knew I had to make one up. It is such a beautiful design, with lovely, sporty seaming. 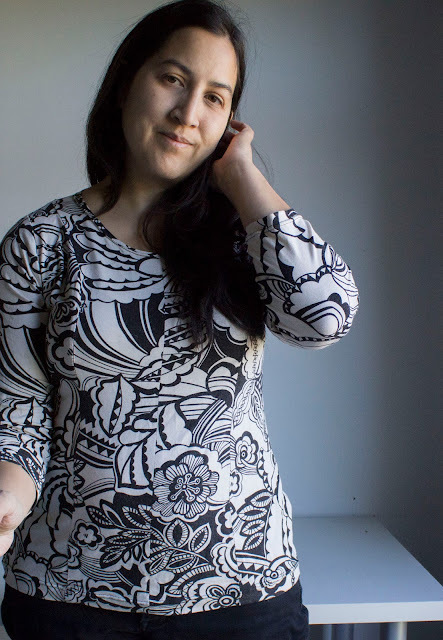 I was a bit nervous about it-- you never know with a new pattern company, and there aren't many versions in the blogosphere who aren't pattern testers. Let me tell you, this pattern is AWESOME. It went together like a dream. Well thought out, well drafted, good directions, and a pretty good sew along. I love the length in the back, and the slight flare from the hips. The awesomeness started with putting together the PDF pattern. It was designed to go together with NO CUTTING. Sweet. I often put them together without cutting even when they are not designed for this, using the slight translucency of regular printer paper to line things up and tape them in place. But I just love a designer who sets up their pattern for fast taping with no cutting! With all those pieces, I was worried about fit and also making sure things lined up. I seriously considered making a muslin, but I came to the conclusion that it would be pretty pointless since the stretch of any cheap knit in my collection would be quite different from the performance supplex I planned to make the real thing out of. Instead of making a muslin, I painstakingly basted together my pieces before doing any real sewing. The fit was spot on, just perfect. Even the sleeves, which are often a problem for me since I have thick upper arms, were perfect. The length was perfect. The one thing the muslin told me, though, was that my lighter fabric (the scrollwork fabric) felt a bit too light on its own. Let me diverge for a moment to discuss fabrics. I'm pretty picky about performance fabrics. I have a long history with performance gear-- it might be hard to tell with my life and interests right now, but I used to spend 3-5 hours a day and every weekend working out or engaged in outdoor related sports. I taught and competed. I was very into climbing, trail running, skiing (cross country and telemark), kayaking, mountain biking, and lately, road cycling and spinning. I lived in my workout and outdoor clothes, and it was pretty much all I bought. My last obsession, before I stopped buying RTW, was Lululemon, and I still have a great collection of workout wear that is still going strong, all of it at least 4-6 years old. 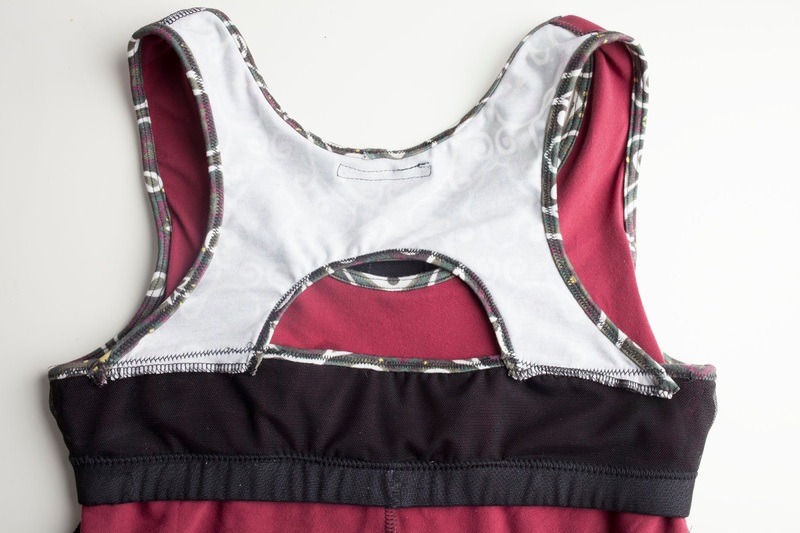 I hate slick, shiny workout fabrics... they feel cheap and yucky to me. Most of what I've seen sold as workout fabrics falls into this category. 2 way stretch is a no-go. The only stuff I've found that I like comes from Peak Performance Fabrics in CA, from their supposed Lululemon fabrics. It is entirely plausible to me that these fabrics are the real deal, they have a lovely cottony hand (and no cotton! ), amazing recovery, and seem fairly durable (so far). This stuff is not cheap-- the black pant-weight supplex is CAD $27/yard. The exchange rate helps, but the shipping is killer. 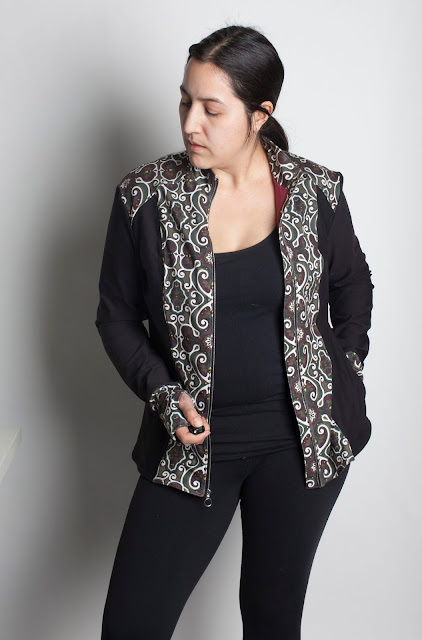 For this jacket I had in mind the pant weight black Lulu supplex, which is nearly like a ponte, and a lovely green and burgandy scrollwork medium weight supplex. I knew the medium weight was a bit iffy for the Sundance jacket... and that seemed true in my basted together test. The other bummer for this fabric is that it was a one-sided print... the back side was white, which just looked pretty lame in an unlined jacket. But, I just happened to also have a coordinating solid burgandy medium weight supplex... so I decided that I would underline the scrollwork fabric. I cut out all the requisite pieces from the burgandy solid supplex, then basted the scrollwork and burgandy together so that I could treat them as one piece. The exception was the front panels. For the front panels, I used the burgandy as a lining, sandwiching the zipper in between the outer scrollwork fabric and the inner solid burgandy. 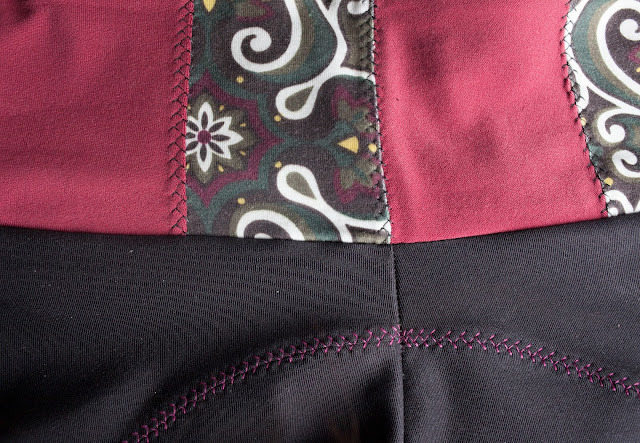 Then, I caught the edge of the burgandy fabric when I topstitched the princess seams on the front of the jacket. 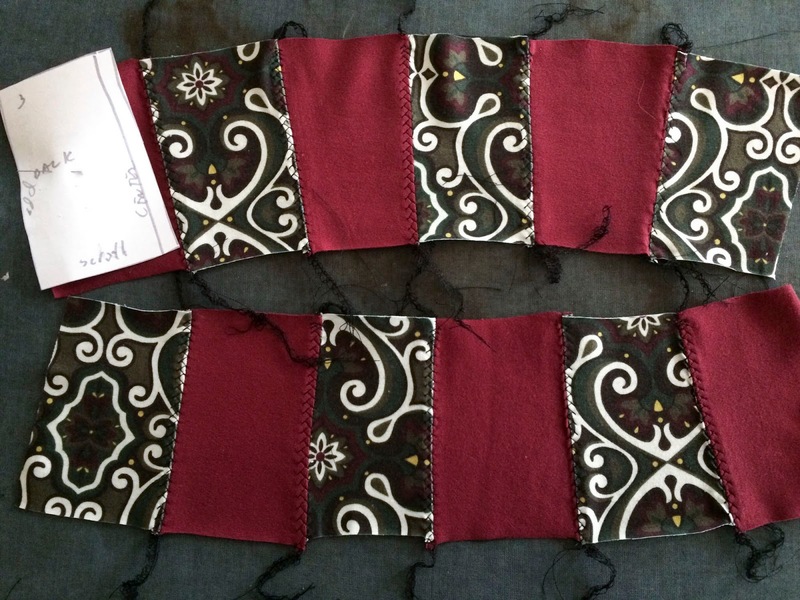 That was a bit of a hope and a prayer-- and lots and lots of pins-- since I had to do the topstitching from the outside and catching the burgandy was totally by feel. It turned out pretty okay, just a tiny bit of a waver on the inside seam. 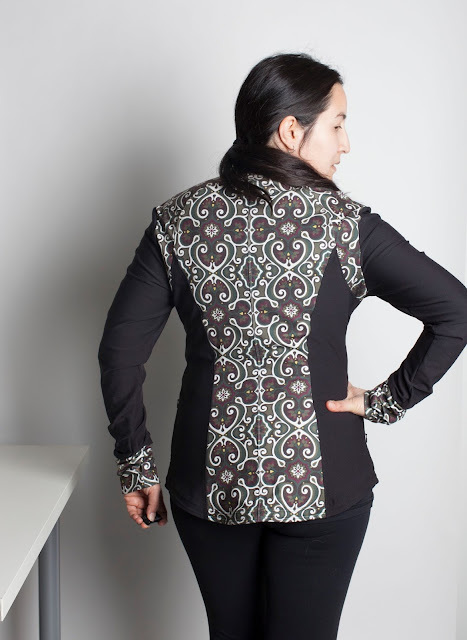 The other difficulty of the scrollwork fabric is that it definitely demanded pattern matching, especially down the back seam and around the center front zipper. I cut it out single layer, one piece at a time, making sure they would match when seam allowances were taken into account. When I put them together, I used Wonder tape to make sure I had the sides lined up before I stitched. The end result is pretty darn good! There are some places that irk my perfectionist self, but generally I'm pleased. For the front zip, I used a Riri zipper. I'm so glad I did, I just looooove it on this design. I used a little circle pull, which totally says sporty to me. 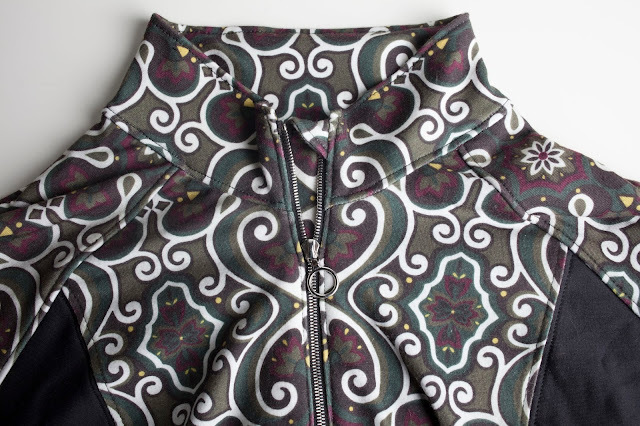 The finish on these zippers is just unlike anything else, and they are super smooth. Speaking of zippers, the zipper insertion in the front is perhaps one of my best to date. The top and bottom line up perfectly (it is a bit hard to see with the zipper guard in place). The two sides are quite even. 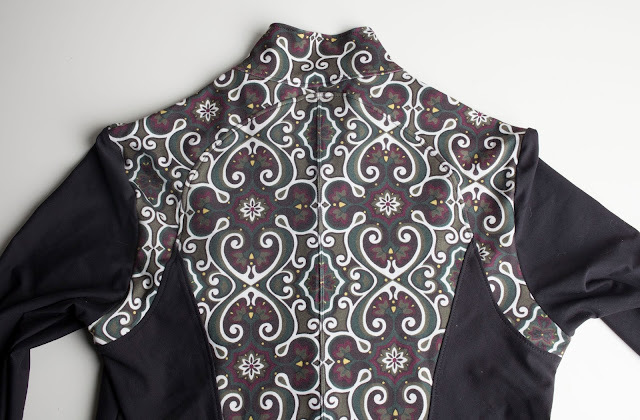 I interfaced like crazy... both the scrollwork fabric and the lining were interfaced with strips of light weight knit interfacing. The zipper guard is also fully interfaced. Lots of wash-away wonder tape was involved too. Interestingly enough, I did the top stitching without my zipper foot... it actually seemed to work better, and come out straighter. 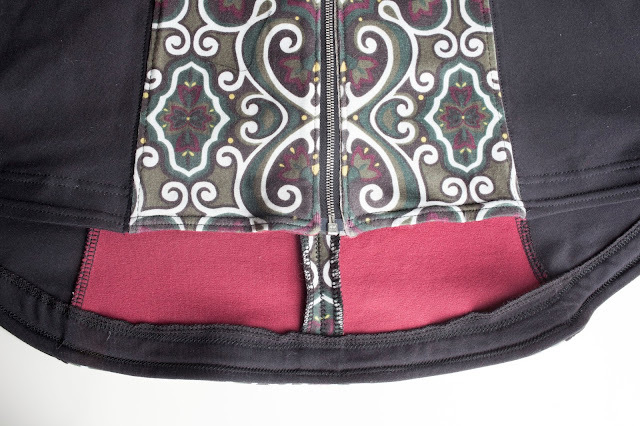 Another detail I love... zippered side pockets. This was probably the hardest part, and involved the most seam ripping, mostly because the instructions didn't say to interface, and I didn't follow my instincts. So the first try went all wonky, and I painstakingly undid it all. Then I interfaced both sides with strips of light weight knit interfacing. The second time went much better! I still had trouble at the bottom of the zipper where it intersects with the side seam, so I did that last half-inch with hand stitching. That was the only way I could get it to lie perfectly straight. I used invisible zippers, which weren't what the pattern called for... but it was what I had on hand, and I'm not sure if that might be the cause of my troubles. I made the pocket bag for the pockets out of a light weight black supplex, also from the Lulu fabrics at Peak Performance Fabrics. 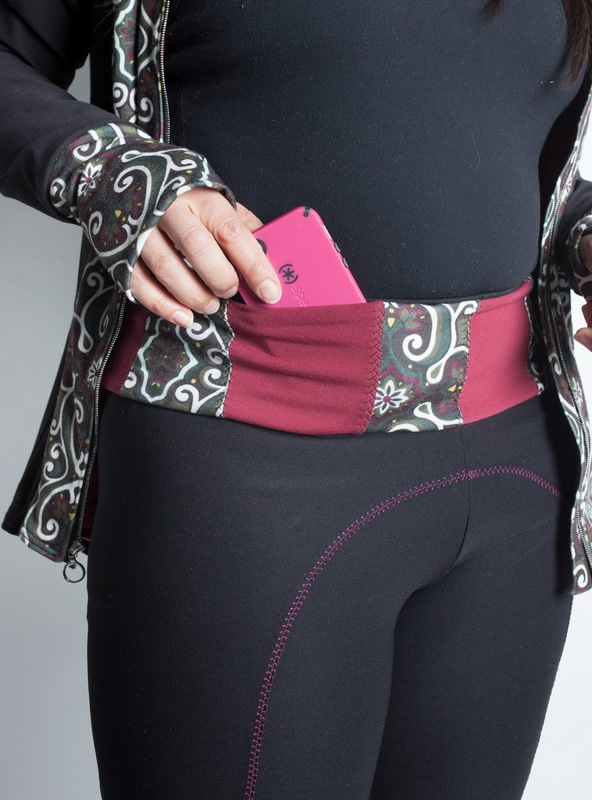 I just loooove the pockets... just in the right place, big enough to put your whole hand in, and I love having a zippered pocket in my workout gear to keep my phone or key secure in. The other super cool feature-- thumbholes. I've never made them before, but I love them on my workout gear. Greenstyle had a cute video to show you how to do it, it worked like a charm. The one thing I couldn't figure out was whether they thumbholes were supposed to line up with the inner seam of the sleeve, and in looking at my other workout gear I decided that actually, it would be more ergonomically correct to have the thumbholes about an inch turned out from the inseam, so that is what I did. This was my first big project on my serger. The inside of the jacket looks so professional with all of those serged seams, I just love it. Another thing I love about this pattern is that it included a pattern piece for a bottom facing. What an elegant way to finish the hem. I ended up doing a double line of twin-needle stitching to secure the hem facing, which is probably and unsual choice but I think it looks rather nice. When I was playing with color blocking possibilities, it occurred to me that I could have chosen to put some burgandy on the outside. But I think I like my design choice to have the burgandy just peeking out every now and then. Well, I think that's about it! I'm working on a matching top and leggings, but that all isn't going so well. I'm having some issues with the Fehr Trade XYT top... argh. But that's a problem for another post. I think I'm really going to enjoy this jacket for spring workouts. It is just the perfect thing to throw on over a sleeveless workout top to take the chill off of the beginning and end of workouts. And should I decided to leave it on, it should breathe really well since it is unlined wicking fabric. Oh, and if anyone knows other places to get really high quality wicking performance fabric in the US, please let me know in the comments. Greenstyle mentioned Zenith and Quasar, has anyone used their fabric?